Here's just a small sampling of what we do at Grace. 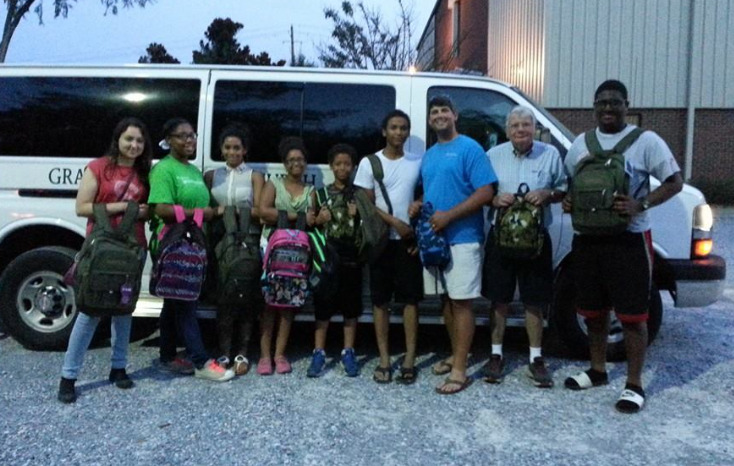 Every year we give away hundreds of backpacks as a part of our youth evangelism and outreach ministry. We are passionate about the youth in our community. Each year, as a part of our youth evangelism and outreach ministry we gear up and hit the streets, giving our backpacks and school supplies to the disadvantaged in our community. We believe in servant evangelism! Beginning in March 2016 we embarked on a journey to bring the community to Jerusalem...while not leaving Millbrook. Passport to Jesus is our way of making Calvary real and sharing the Gospel of Jesus Christ with our community. The event includes an interactive obstacle course beginning with a donkey ride over palm branches and ending with a stone rolling experience. We also include a dramatic reenactment of the birth, death and resurrection of Jesus. We believe that the Gospel can be spread abroad through various means. One means is through supporting foreign missions. Our church works with Samaritan's Purse through Operation Christmas Child to give hope, happiness and Christ to those who have never heard of Jesus. Grace serves as a relay center for OCC and has shipped more than 1200 boxes to various countries.